For dumping her new baby boy in a refuse dump, a middle aged woman is now cooling her heels in police custody in Jigawa. 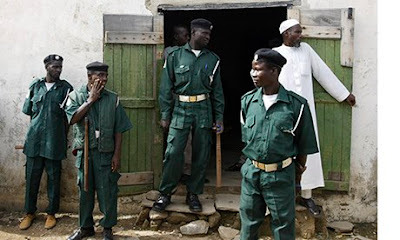 Malam Sa’idu Aliyu, the State Commandant of the Jigawa Hisbah Guards, told the News Agency of Nigeria on Tuesday in Dutse that the suspect (names withheld) was arrested by the guards on Oct. 29. NAN reports that Hisbah is the Sharia Law enforcement agency in the state. According to Aliyu, the suspect is a resident of Bulakalu Village in Dutse Local Government Area. He said the woman dumped the baby in Shuwarin Village in Kiyawa Local Government Area of the state. The commandant said that the baby was picked by a `good Samaritan’, who took him to the district head of the community and later reported the incident to the police. According to Aliyu, upon receiving the report, Hisbah deployed its intelligence officers to the two local government areas to fish out the mother of the baby. According o Aliu, the guards eventually got an intelligence report that a woman in Bulakalu Village gave birth to the baby. The residents said they had not been seeing the suspect with her baby. For that, we invited the suspect to our office where she confessed to being the mother of the boy. She also confirmed that she was the one, who personally dumped the baby, because of fear of stigmatisation for giving birth out of wedlock, he said. Aliyu said the baby was in good health and in the custody of a woman in Shuwarin Village, pending conclusion of investigations into the case. He said the suspect had been handed over to the police for further action.